I haven't done this before. I've never featured a product here on Slab Sunday that wasn't natural stone..... today I am featuring Vetrazzo! Last week I wrote about how excited I was that Vetrazzo is now stocked at Contempo's Slab Gallery in Salt Lake. You can read that article here. 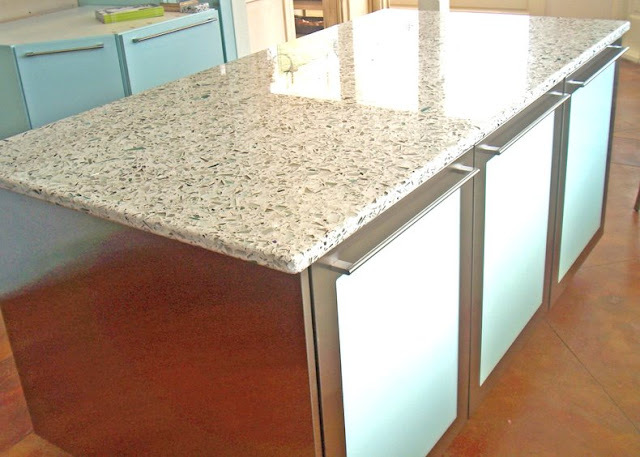 Vetrazzo is recycled glass in concrete. The glass is 100% recycled and makes up about 85% of the slabs. It is the greenest surface material on the market. Most of the glass comes from curbside recycling programs. Other glass comes from dinnerware, windshields, stained glass, traffic lights and more. It's really cool to see where they get all of the glass. From Skyy Vodka bottles (pictured above right) to architectural glass each slab has a unique look and story. Vetrazzo was invented in 1996 in Berkeley, California by a glass scientist. In 2010 they were acquired by Polycor and so they moved their facility from Richmond, California to Tate, Georgia. Now the Vetrazzo slabs are made right next to the historic marble from Polycor. Due to its high recycled content, using Vetrazzo can help your project qualify for LEED certification. One of my favorite things about Vetrazzo is their tag line..."there’s a story in every surface™." If you go to their website and check out the color palette you can click on each of their colors and read that color's story. It will tell you where the glass comes from and you can see pictures of finished projects in that color. "Once (the glass) sorted, it's crushed and packaged for companies like Vetrazzo to purchase for reuse. We look for interesting colors and also source from post-industrial glass sources and demolition sites to get an array of options for making slabs. When then glass arrives to our plant, it's further crushed depending on the slab being made, and mixed with cement, water, and other proprietary ingredients. Glass comprises 85% of the total product content, so you can expect an extremely durable and gorgeous surface thanks to the big pieces of glass that appear in many of our surfaces. Once a slab color is mixed, it's poured into a pan and baked (much like making a cake). After the cooking process, the slab undergoes polishing and quality assurance procedures to ensure that every slab leaving our plant meets our quality control requirements. Right now, it takes almost a month for one slab to be produced. Unlike other surfacing materials, our product receives a lot of human attention from our production team. From the woman who expertly applies the patina to our patina'd surfaces to the man who carefully monitors each slab's polish, Vetrazzo gets a special touch. You can be assured when you buy Vetrazzo that you are getting a product that many people are passionate about, especially the people who make it." Color: Alehouse Amber. Photo: Vetrazzo. Color: Ruby Red. Photo: Vetrazzo. For more information on Vetrazzo, go to their website and their Facebook page. Also, don't forget to enter our Giveaway this week! We're giving away a set of Whiskey Stones. Go here to find out how to win. I dream of putting the Floating Blue in my next kitchen! I am debating on one of the whites for my new home in the kitchen. My favorite color is the cobalt blue, but they are all gorgeous. Thanks for the info on this great product. Two years ago, we installed a Vetrazzo countertop in our $250+K kitchen remodel. After the first 6 months the little glass pieces started chipping out of the filler especially around the edges. Now the top is stained in two places and the Vetrazzo website says this just adds to the beauty.... wrong… it just looks stained. The surface, in many places is rough where the filler is breaking down. The original company was located in California, but it has since been sold to a company in Georgia. We went back to the manufacturer and got nothing but nasty emails telling us it was our fault for not maintaining the surface properly. This is NOT the case, everything in our kitchen is BEAUTIFUL... the Vetrazzo countertop will have to be replaced. It's definitely NOT sustainable! Please warn your readers to be careful about what they wish for. I like the look of Vetrazzo and the idea of using recycled materials, however the cost is really prohibitive, more than twice the cost of granite. I wish there were a less costly earth friendly option.